Another year has passed us by and the T20 game has continued to evolve. Like in recent years, we’ve had some thrilling T20 games this season as well. Even though the Sri Lankan team managed to beat South Africa (2-1) and Australia (2-1), both away from home, they won only five out of the 15 T20Is they played this year. India hosted a couple of closely-contested series, while the Windies continued to enjoy the shortest format. However, teams like Australia and England had an indifferent year in the T20I format. Here, we look at some of the best T20 international games that took place this year. After consecutive victories in the first two ODIs (in Pune and Cuttack), England got some momentum back with back-to-back wins in the third ODI (in Kolkata) and the first T20I (in Kanpur). The hosts needed a win in the Nagpur T20I to keep the series alive. After being put in to bat, India got off to a solid start, cruising to 30/0 in 4 overs. However, wickets at regular intervals halted their charge as they reached 69/3 in the 11th over. The pitch looked sluggish and a score of about 150-160 would’ve been competitive. KL Rahul batted beautifully, compiling 71 to put the ‘Men in Blue’ back on track. But, his dismissal in the 18th over took away all the momentum they had gained as India could only manage 20 runs in the last 3 overs. 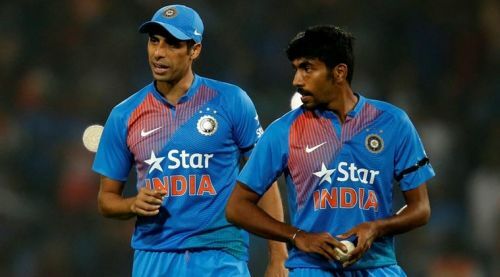 Chasing 145, England lost two wickets in two balls (to Ashish Nehra) in the 4th over and were reduced to 22/2. Contributions from Joe Root (38), Eoin Morgan (17) and Ben Stokes (38) put England ahead in the run chase. But timely wickets kept India in the hunt. With 8 required in the final over, England looked firm favourites to seal the series. But death-specialist Jasprit Bumrah produced a magical over. He first removed the well-set Root and cleaned up the dangerous Jos Buttler to seal the game for the hosts. Bumrah gave away just two runs in his final over and picked up two wickets to earn the Man of the Match award. This 5-run win helped India level the series 1-1.